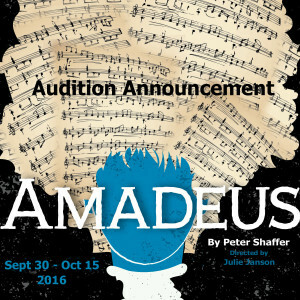 Final auditions nights for Amadeus are tonight and tomorrow (Monday, June 27 and Tuesday, June 28) at the James Lee Community Center Theater, 2855 Annandale Road, Falls Church 22042. Please RSVP to providenceplayers@cox.net. A haunting, psychological drama about the relationship between Mozart and his less gifted admirer and bitter rival composer Salieri, this story won the Tony Award for Best Play and eight Academy Awards, including Best Film and Best Screenwriter. Salieri is the established court composer who has given himself to God so that he might realize his sole ambition to be a great composer. Enter the greatest composer of all time: Wolfgang Amadeus Mozart, a foul-mouthed, graceless oaf who has that which is beyond Salieri’s envious grasp – genius. The Providence Players of Fairfax is a membership organization. Membership is not required to audition. If cast, actors in addition to production team members will be asked to become members of the Providence Players ($10) for the season (if they are not already). Auditions will be held in the theater. Please come in the front of the community center and sign in at the counter. The staff can point you in the direction of the theater and signs will be posted. PLEASE RSVP to providenceplayers@cox.net with the date(s) you plan on auditioning. Thurs 23 June, 6:45 – 9:45 pm (In the James Lee Theater): This day is for Salieri auditions ONLY. See character breakdown for more information. Mon 27 June, 6:45 – 9:45 pm (In the James Lee Theater): Open Auditions. Readings from the script. See attached sides. Tues 28 June, 6:45 – 9:45 pm (In the James Lee Theater): Open Auditions. Readings from the script. See attached sides. This play provides an excellent range of difficulty and therefore has something for everyone, whether you are a seasoned actor or brand new to the stage. All are welcome. Below are the ages and some of the descriptors suggested by the playwright; however, no one should disqualify themselves based on this information. I provide my own notes for some guidance on what is important. We will be staying true to the location and period of the script: 18th Century Vienna. Most dialogue will be formal American English, but note that most characters have lines in different languages including French, German, and Italian. Additional note: If the Venticelli are female, there will be two small speaking roles for men in a scene with Constanze. Right now my plan is to use the actor playing the Valet and Guiseppe Bonno, but that is subject to change. Antonio Salieri (male, 30-50): The action of the play is driven by the contrast of the man Salieri thought himself to be (pious, humble, talented) with the man he is willing to become (a manipulative purveyor of psychological destruction). Must be able learn/handle a large amount of material and commit to three months of consistent rehearsals/line memorization (July, August, September). Salieri is in EVERY scene of the show. Salieri auditions are 23 June and a monologue is required. The preferred monologue is attached but a serious monologue which is at least 2 minutes long is acceptable. You will also do some readings of Mozart/Salieri scenes from the script (see attached sides). All actors are welcome to return on 27/28 June to audition for other roles. Wolfgang Amadeus Mozart (male, 20-40): “An extremely restless man, his voice, light and high; his manner, excitable and volatile.” Willing to take risks physically and vocally; ability to play some piano is a perk but not required. These are the pieces I would like for Mozart to play live (if able): some of the march from Marriage of Figaro, and a quick example of temolando, sforzando, C minor, and D minor. Other than the march, most people could easily learn the rest, even if they don’t have experience. 2 x Venticelli (male or female, age neutral): “Purveyors of fact, rumor, and gossip throughout the play. Sometimes they speak to each other; sometimes to the Audience—but always with the urgency of those who have ever been first with the news.” These characters serve partially as narrators. They often speak rapidly through repeating and/or overlapping lines. Salieri’s Valet/Priest/Major-Domo (male, age neutral): Not very many lines but a frequent and important presence throughout the show – especially as Salieri’s valet. *Katherina Cavalieri (female, 20-40): Salieri’s “beautiful” pupil. This role is traditionally non-speaking but I am looking for a soprano who can sing a baroque concert aria and “Kyrie” for the C Minor Mass, instead of miming these sections. Otherwise this character doesn’t have any lines. Come prepared to sing (arias preferred, memorization not required). *Guiseppe Bonno (male, age neutral): Preferably a pianist who will accompany Katherina on her baroque concert aria. If Mozart cannot play the piano, I may also use this actor as a sort of “double” to Mozart. Come prepared to play a classical piece, preferably by Mozart. There are NO pauses for scene changes in this play. The minor set changes are done by “servants” (stage crew and actors) who work while the actors continue to engage in conversation. I am VERY conscious of an actor’s time. I have broken this play into 30 scenes, some of which are only a page or two long. I have tried my best to group actors so that they get the most out of their time at rehearsals. See attached scene breakdown for more information. August will be focused on getting the primaries comfortable in their scenes. In late August/early September we will layer in the secondaries, tertiaries, and citizens. A copy of the preliminary stage rehearsal schedule is included with the complete audition package included in this announcement and will be available online and at auditions. Stage rehearsals begin August 29, 2016 – this is when most actors will have regular rehearsals. Before that, there will some readings, selected scene study, and character work based on actor availability in July and August (mostly focused on the leads). The schedule for these will be finalized a week or two after casting and will be based on crew and actor conflicts. Unless indicated otherwise, all rehearsals will happen at the James Lee Community Center. Rehearsals will be held in the evenings roughly from 6:45 to 9:45 pm and on Saturdays and Sundays as indicated. Come to auditions prepared to list any availability conflicts over this time period. Space is provided on the audition form for this purpose. HOW WE WORK: You are welcome to come to audition on more than one of the open audition evenings. This is not a requirement. Most PPF auditions have actors up and down to read multiple times in multiple combinations and scenes. Most actors find this fun. 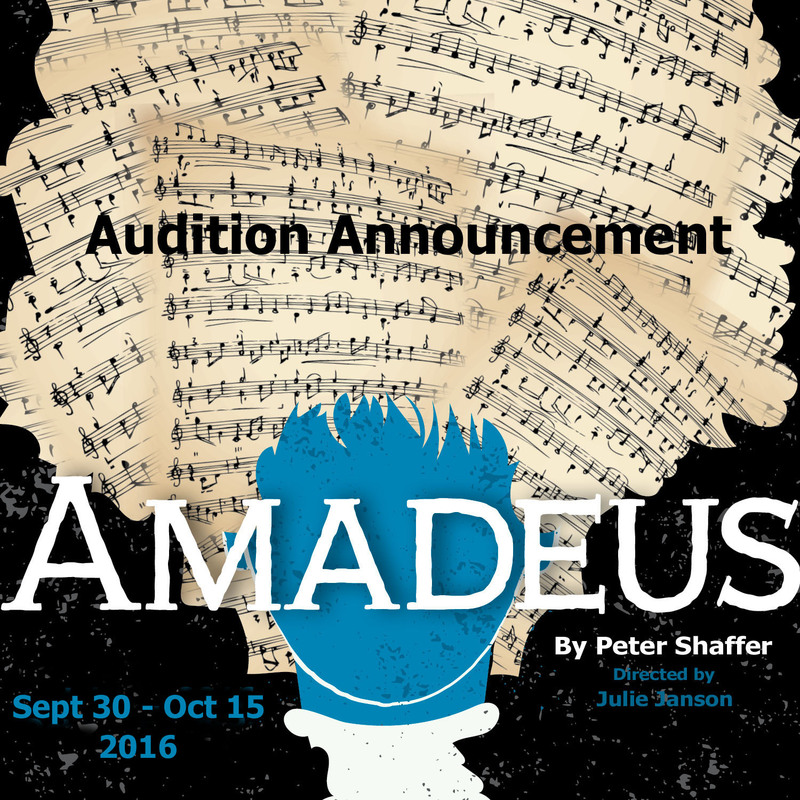 With the exception of the Salieri auditions and as space allows, you will be able to watch the auditions. You may be asked to go into the hallway with audition partners and work a bit on a scene. We will do our best to get you up multiple times reading for parts you are interested in. You will also be asked to read for other parts you may not be auditioning for. The Providence Players strives to make our productions open to interested and engaged actors & actresses, regardless of their level of experience. We try and make our auditions as relaxing and fun as possible. AUDITION PROCESS & SIDES: Auditions will consist of readings from the script. No monologue required (unless you are auditioning for Salieri on the 23rd) although one of the sides may be a monologue from the play. Sides for the audition process will be supplied at auditions and are included in this announcement (print the complete audition package). Additional sides may be added at the auditions. AUDITION FORM: Resumes and headshots will be accepted, but are not required. Please ALSO COMPLETE the attached PPF Amadeus Audition Form (included in the complete audition package) and bring it with you to the audition. Amadeus is probably the most successful serious play of the last half century. It has triumphed everywhere. So what is its extraordinary appeal? Amadeus is a clear-eyed celebration of Mozart and his music. He is someone whose genius can stand with Shakespeare’s. Wolfgang is of course dangerous to let on to the stage, because playwright and actors have to live up to a creativity that is almost superhuman. He also happens to be one of the great theater composers: his music easily commands a stage. But if the portrait can be convincing, the fascination is boundless—and makes for high drama. Shaffer’s play of course goes deeper. It looks unblinkingly at the rest of us, who are neither blessed nor cursed (like Mozart) with genius. It analyses with compassion and wit how desperately ordinary most of us are. For however talented we may secretly think ourselves to be, we remain in the great scheme of things relative mediocrities. It is only genius – that rarest and most precious of states – that is unaffected by fashion and indifferent to competition… Only genius makes its own rules. AMADEUS will be my directorial debut at PPF; however, this will be my 10th production with PPF where I serve both on the stage and behind the scenes. I have actively participated in more than 30 productions over the past 20 years, including my direction of Peter Shaffer’s Black Comedy in 2004. My other directing credits include The Elephant Man by Bernard Pomerance (2012); Shadow Box by Michael Cristofer (2004); and Reckless by Craig Lucas (2003: Boston University Stage Troupe). 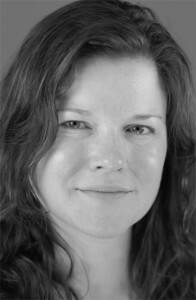 As a director, I believe first and foremost in creating an environment where both actors and crew feel inspired to challenge themselves and reach their maximum potential, all while having a positive, fun experience which results in a theater family. We will be one of the first companies to have the honor of presenting this masterpiece after the tragic passing of Sir Peter Shaffer. We will do everything in our power to properly honor his greatest work. This is a challenging show, but I believe the outcome will be extraordinary. I hope you will join us on this journey. ← Introducing our 2016-2017 Season!